WaterTechs W5330 Whirlpool Walk-in Bath is designed for individuals with mobility issues that prevent them from stepping and lifting their legs over the sides of a bathtub. WaterTechs walk-in baths have an end drain and overflow. Every W5330 includes the cable drain and overflow kit that the plumber will install. The faucet is typically installed at the drain end of the tub. For the safety of the bather the floor of the W5330 has a slip resistant texture. A comfortable seat 15” high and 21” wide is sculpted into the bath. The baths entry door swings inward to insure when the door is shut, the pressure of the water pushes the door against the baths watertight seal. Note: Doors that open outwards have the pressure of the water pushing the door away from the seal, possibly causing leaks and also hitting the toilet, cabinets etc. when opened. The door handle is designed as a leaver to go up to open and down to lock making it easy to operate for the bather that might have problems with their hands. All walk-in tubs can be ordered as a Soaking Tub, Air Bath, Whirlpool Bath or combination Air/Whirlpool therapy bath.. All model W5330s can be installed as a free standing unit or built into the bathroom. One of the most popular options ordered with the W5330 is an inline heater. The inline heater insures the temperature of the water remains constant for the bather who wants to lounge in the tub for an extended period. 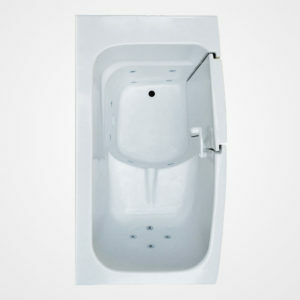 The baths deck on the front end of the tub has ample space to mount a faucet and hand held spray. The tub has a lifetime warranty and is made entirely in the USA. For questions or additional information call 1-888-795-7480 Mon thru Fri 8am to 5pm. WaterTech’s walk-in tubs are available as soakers, whirlpools, air or combination whirlpool and air. Drain Time: 2 Min. 40 Sec.